Next time I do a master plan for anything, please be sure to run it by Lockhart Steele first. Just the other day, I was looking at Curbed, and I saw his brilliant, whithering criticism of the beyond-stupid Hudson Yards Draft Strategic Framework Plan. 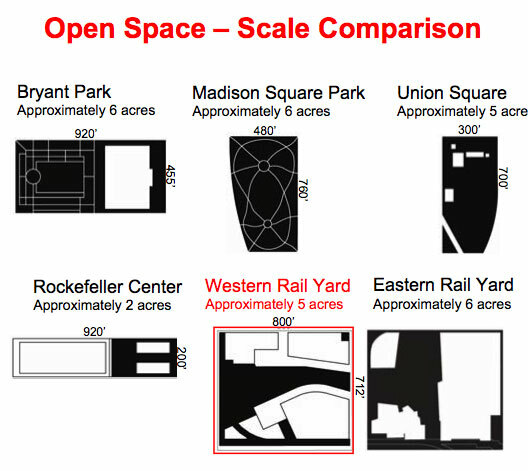 Of particular note: he noticed the glaring stupidity of the Plan's attempt to compare a development site with the size of the open spaces in New York, as if the entire site would be open space. What can we say, Lockhart is good. He didn't mention one important point, but he's probably just leaving something for me to write about. That the Plan is obviously constructed so that one conclusion can be reached: building around the High Line is too expensive, and therefore it should be just knocked down. What architect can't see that this is the most interesting part of the High Line? FxFowle, we had so much faith in you up to now.